Most babies seem to prefer going naked to being dressed, which can make things tricky for moms struggling to get a onesie on a squirmy kiddo. Try these tips to make dressing baby more fun and easy! Help your babe enjoy being dressed by choosing simple clothes that are super comfy. Babies spend most of their time sleeping, eating, or exploring, so now is not the age to suffer for fashion! Your baby might wear only onesies and sweatpants for the first year of his life, and that's OK. Your little one would happily wear a potato sack if it was comfortable. But you're the one seeing them, so why not pick outfits that make you happy? There's no need to dress your baby in gifted items or hand-me-downs you hate just because they were free. Instead, put your little in clothes you like and that won't make you cringe when you see them later in pictures. Everything's easier when your baby is cooing at you instead of wailing, right? Aim for getting him dressed at a time when he's well-rested and happy to see his mama. A baby's good mood and gummy smile are truly contagious! Distract your babe from the task at hand with a game of peek-a-boo. Try variations such as covering her eyes, covering your eyes, and lifting her legs up and down to alternately conceal and reveal her face, all while talking sweetly to her. She'll love it! Pick an outfit and grab your diapering gear before you strip baby down. Having everything you need collected before you start will help make the process as quick as possible (less chance for baby to wriggle away!). Older brothers and sisters who love to help are great at distracting baby and running to grab forgotten items. They might also like to pick out their tiny sibling's outfit; let them choose between two if you're concerned about what you'll end up with! Dress your little in a toasty room for best results. No one wants to get naked in a chilly spot, even a baby who loves taking his clothes off! Babies love songs, so why not bust out with a little "Hokey Pokey" while you're putting baby's "right hand in" her onesie sleeve? She'll also love it if you participate to "do the hokey pokey and turn yourself about." Fun! Skip the struggle of pulling shirts and onesies over your little one's head by choosing button down tops or onesies that snap up or along the side. They're as easy to take off as well, should there be a diaper blow-out later! 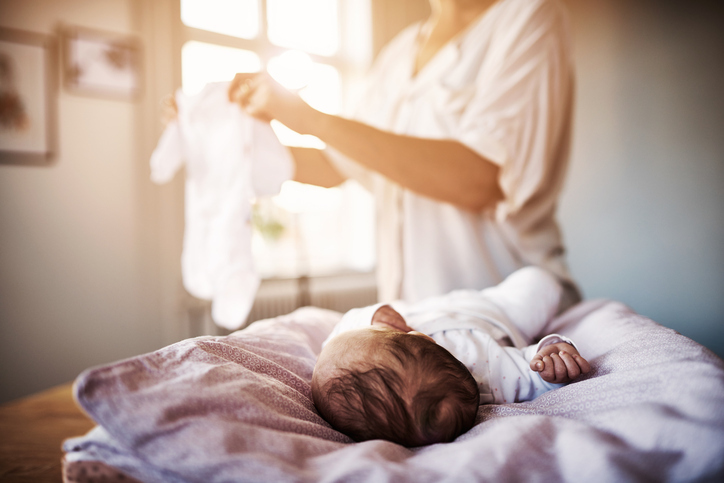 Your little one might seem tough to dress now, but remember that he'll never again be as little, as helpless, and as completely dependent on you as he is now. So try to enjoy dressing your baby as much as you can now—it usually gets harder once they hit the toddler years, yikes!